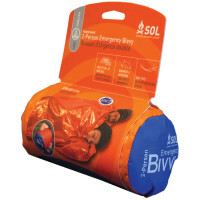 Emergency Space Blankets & Bivvies - Sleeping Bags & Warmth: Mylar Space Blankets for emergency warmth, rescue & survival - see the Amazing Bivvy (Bivouac sack)...the ultra-light, ultra-warm full protection shelter! 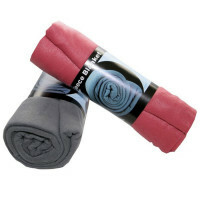 Emergency Blankets reflect 90% of body heat & fit one person or two + they can be used as shelter & for signaling. 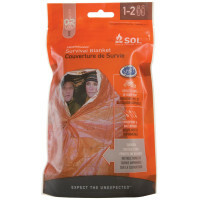 The SOL Emergency Bivvy is a full-protection shelter that reflects 90% of body heat for warmth in extreme temperatures. 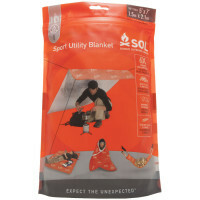 Also see Fire Blankets and Burn Wrap Blankets Get more information on important Survival Skills information. 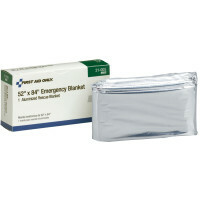 Emergency Shelter using a Mylar Blanket - A space blanket (also known as a Mylar blanket, first aid blanket, emergency blanket, thermal blanket or weather blanket) is a blanket used in emergencies to reduce heat loss in a person's body caused by thermal radiation, water evaporation and convection. 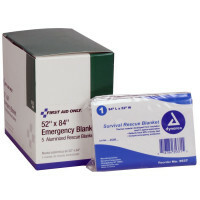 In their principal usage, space blankets are included in many emergencies, first aid, and survival kits because they are usually waterproof and windproof. That, along with their low weight and ability to pack into a small space, has made them popular among outdoor enthusiasts and emergency workers. Space blankets are often given to marathoners at the end of races. 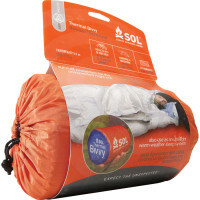 The material may be used in conjunction with conductive insulation material and may be formed into a bag for use as a bivouac sack (survival bag). 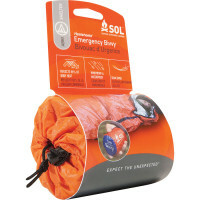 Before we really get into how to use it, we need to know how body heat is lost and how it applies to the use of a Mylar space emergency blanket. So lets look at the causes of heat loss, how it applies to the Mylar space emergency blanket, and at the end, I explain the best way to use it. Convection: happens when wind blows against bare skin which speeds up the process of evaporation, which is another method of heat loss. So, a wind barrier such as a Mylar space emergency blanket, can protect the body from losing heat through the process of convection. Conduction: causes heat loss by having the skin in direct contact with objects or surfaces which are at a lower temperature than that of the body. Therefore, we don't want to use a Mylar space emergency blanket wrapped around bare skin, or without a layer of insulation between you and the blanket. Remember, your body is around 98 degrees in a normal state. If it's 35 degrees outside, and you wrap a 35 degree plastic sheet around your body, you will lose heat through conduction. 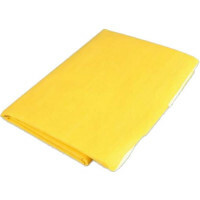 If you are wearing a thick layer of wool, fleece or other insulating layer between you and a loosely wrapped Mylar space emergency blanket, then you will be protected against heat loss via conduction, and convection. Radiation: When the temperature outside is cooler than the body, the body naturally emits heat into the surrounding air. This is referred to as radiation. 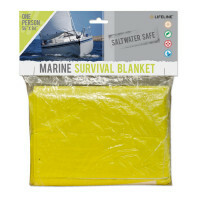 This is where the Mylar space emergency blanket really shines and comes into it's own as a piece of life saving equipment as it reflects up to 97% of radiated heat back towards the direction it came from. Evaporation: As perspiration or sweat, in the form of water on the skin evaporates, it turns into a vapor state as it is absorbed into the air around us. This action creates a cooling effect on the skin and provides yet another means of heat loss from the body. So, the Mylar space blanket, being non-permeable and wind proof is wrapped around the body and closed off, the water vapor released from the body will become trapped by the blanket having no where to escape. Thus, it will increase the humidity inside, and theoretically reducing heat loss by preventing evaporation. These sheets aren't made of the typical foil you pick up at the grocery store, though. 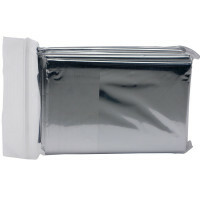 Derived from NASA technology, the common name for these sheets of foil is space blankets. 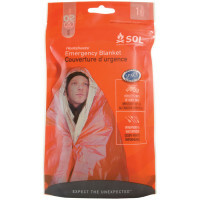 Also known as solar blankets, mylar blankets or emergency blankets, they help people stay warm. Everyone from mountaineers to astronauts to surgeons use them. Even though space blankets are mass produced and cheaply available today, they had their start in the space program in the 1970s. In 1973, the Skylab space station began overheating while in orbit. Because of a broken heat shield, the temperature inside the station approached temperatures of 130 degrees Fahrenheit (54 degrees Celsius). As temperatures continued to rise, NASA personnel worried about the decay of equipment and food inside the station. The possibility of toxic gases was also a threat.